I'm going to audit my hipness for a second. You can tell a lot about someone's underground video game cred by how early he bought 2005's Pathologic. (I use the male pronoun because girls don't play video games.) Maybe he bought it after Rock, Paper, Shotgun's enthusiastic post-mortem, along with ten thousand other commoners. Or maybe it was 2006, after John Walker's stunning Eurogamer review. Or maybe it was day one, after he read a review unscored critique in a Russian fanzine. He filed it beside his Dostoevsky and Nabokov first editions, chuckling at the gaming mainstream who still clung to their Fable and their San Andreas. So when did I get it? Uh, the Rock Paper Shotgun thing. It really was an impressive piece that doesn't leave me with anything new or interesting to say about Pathologic. To be honest, that's kind of a disincentive for me to finish the game. The other big disincentive is Pathologic. You hear a lot about its tragically flawed beauty and crippled transcendentalism with less emphasis given to the first parts of those descriptors. It's functionally awkward and stilted. It's kind of a lousily put-together game, period. Enter it sceptical and disappointed. 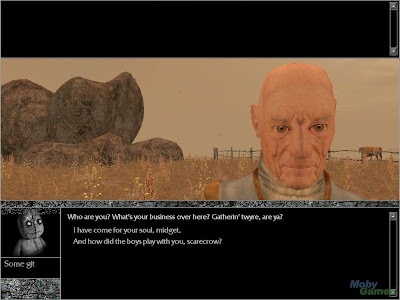 Nonetheless there is something charming about Pathologic weirdly dying in front of you. A lot of that has to do with how it talks. I think there's an uncanny valley in effect for translation. If it's just slightly -- but clearly -- wrong, as is the case with many, many games, it really drives me crazy. This applies to every adventure game released in the last seven years except Sam & Max. Translation consists of a cursory pass which renders the words recognisable but never structured in a way that would ever be produced by an English-speaker. Beyond Good & Evil's "intruders have penetrated into the facility" forever resonates, along with other grammatical faux pas. I always wonder why these English-speaking actors never correct their lines. Maybe they think it's some video game thing or maybe they have to blow through this gig so they can get to their toilet commercial by 2:30. Pathologic's translation stands at the absolute edge of the valley, threatening to jump. You could call it stylised if it wasn't so demonstrably wrong. It's beyond minor imperfections and "real people don't talk like that." Pathologic is so far gone it's like it was never translated at all. A plague runs through a broken city and the player is trapped inside. Pathologic's language is of urgent emotional distress and stark terror presented through clinical and impenetrable literary and metafictional ambition. Its boldness and verbosity is rendered grandly ineloquent and as you read along you frequently stop to pick out the wrong word choices and wonder what any of this actually means. It shouldn't be this complicated. Maybe it should. Pathologic is characterised by the inexplicable and the inconsistent. This game is at once so broken and discordant, but every part, every mistake, is working to alienate, intimidate and oppress the player. Translation included. It's a rationalisation, and it's a game for whom rationalisations are necessary to like. Regardless, a lucid translation wouldn't be appropriate here, and anyway, making sense of this game would be horrifying. This is a world wrenched out of sync with itself; quickly, violently throttling towards its own destruction. It needs help but it can't speak, communicating only in obscured spurts of choked, screaming brilliance. It is a wreck. It is an abyss. You have to look into it to understand it and you hope that by the end you'll know enough to tell if it was genius or madness.